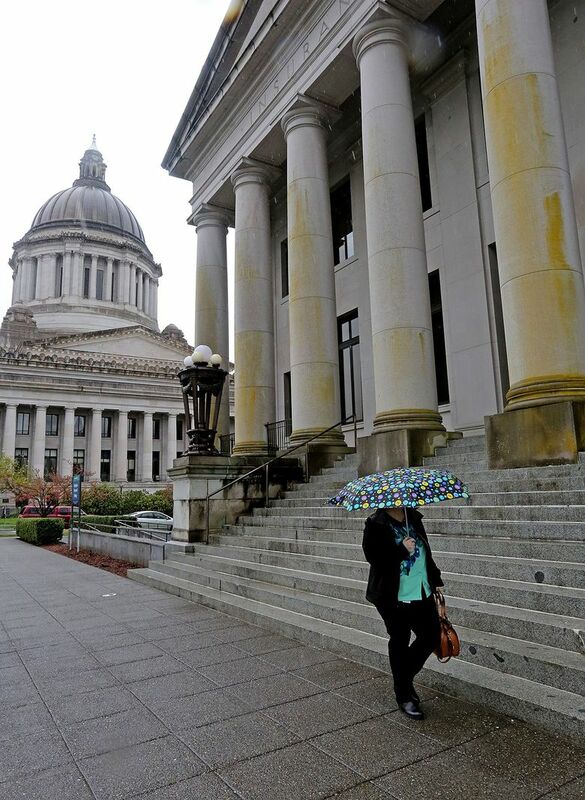 As management debacles pile up in Olympia, Gov. Jay Inslee’s job-approval ratings rose. Is that because we don’t care? When I see Gov. Jay Inslee on the debate stage, the Lego Movie’s “Everything is AWESOME!! !” plays in my head. Inslee is running for re-election as Sunny Jay, relentless utopian, the dude you want to drink with, the one with the “can-do optimistic positive vision for the state,” as he said in Monday’s debate with Republican challenger Bill Bryant. And why not? Inslee has three times as much money as Bryant and a 12-point lead in the latest polls. The state’s economy is riding the froth of Seattle’s boom. And Republicans are on the downer train this year, chained to Donald Trump’s dystopian message. Bryant’s longshot campaign has yet to put a rain cloud over Sunny Jay. In Monday’s debate, Bryant stuck with his strategy of hammering on Inslee’s Achilles’ heel — the management snafus that have popped up with regularity under the Inslee administration. Inslee has never been viewed as a great executive. Pollster Stuart Elway found just 37 percent of voters rate Inslee as “good or excellent” at managing state government. In the past year, we’ve learned what that looks like. We learned three people were killed when 2,800 inmates were let out of prison early by a long-known software-programming error. A botched rollout of toll lanes on Interstate 405. A federal judge issued huge fines because a dysfunctional Western State Hospital could not admit mentally ill patients being held in jail — and the hospital managed to lose 25,000 master keys and let two dangerous patients escape. Despite all that, Inslee’s overall approval ratings — and voters’ assessment of his management skills — actually went up in the Elway Poll in August. That’s the kind of sunny glow you get when you run for governor in Washington with a D behind your name. When I talked to Bryant after the debate, he sounded frustrated that the “failed executive” line is not landing punches. He blamed the media for letting Inslee slip past the scandals with no political cost, which is what you’d expect from a trailing candidate. I’d point out that it is tough to pin each bureaucratic disaster on the chief executive of a 110,000-employee shop, and that Inslee has some administrative successes, including minimal glitches (compared to, say, Oregon) in the rollout of the state’s Obamacare health-care exchange. But Inslee is vulnerable on the Western State Hospital debacle, and Bryant has sharpened his attack. The psychiatric hospital failed four federal audits so badly that the federal Centers for Medicare and Medicaid Services has essentially taken over. A federal judge said Inslee’s human-services staff “failed to show the leadership and capacity for innovation” in fixing the mess. And Inslee vetoed a key part of the Legislature’s bipartisan solution for Western State Hospital. Even in the context of a decades-long breakdown in the mental-health system, this is really bad. And it actually keeps getting worse. Inslee administration officials quietly gave up Western State Hospital’s independent accreditation — essentially a gold stamp of quality — as a hospital. A health-care recruiter told me it can be harder to recruit staff to a non-accredited hospital, and that’s Western State’s biggest challenge right now. Accreditation status is the kind of thing staff and legislators would like to know. But Inslee’s staff kept the decision quiet for three months until the media uncovered it. When Bryant tries to land punches, Inslee blames the mess on funding. Nevermind that the Legislature gave Inslee what he requested for the current $2.2 billion biennial mental-health budget. He’s working with the amount he wanted. Nevermind, because political consequences for management failures seem to slide right off Sunny Jay. Maybe voters don’t care that much about the breakdowns. Maybe we get the government we expect, and our expectations are minimal. Maybe voters are retreating to tribal partisan politics in the bleakest president campaign in memory, and Sunny Jay is seen as an antidote to the negativity. Six weeks until Election Day, and everything is awesome.